Summer is the season for copious amounts of fruit. 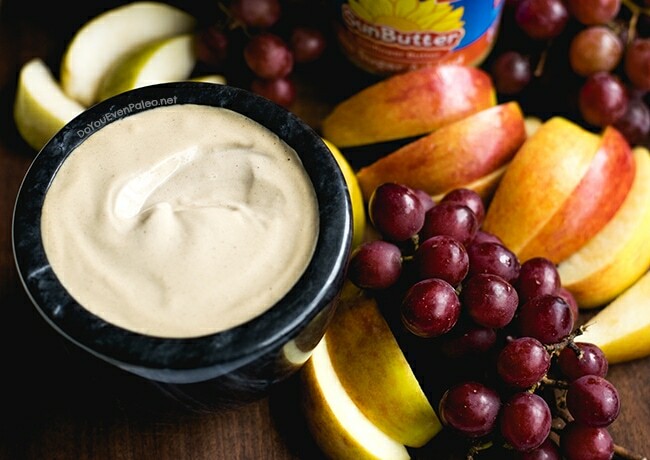 A Simple Sunbutter Fruit Dip makes an excellent companion for all your fruit-gorging on hot days! 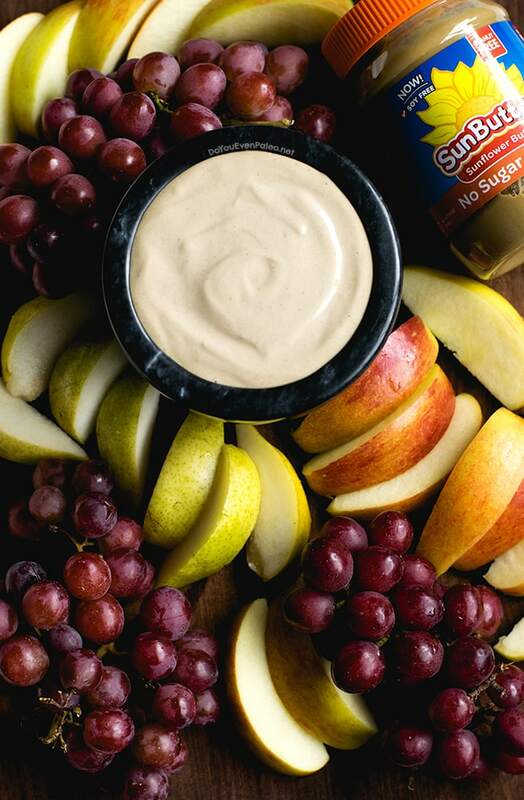 With only 5 ingredients, this fluffy and smooth dip is as easy as summer eating gets. And the only piece of equipment you need is a blender or food processor. I developed this recipe in partnership with my Fargo friend Kylee from Kai Fit! Quick note: Kylee asked me to create a recipe or two for the giveaway. This post isn’t sponsored by Sunbutter, but the giveaway is. 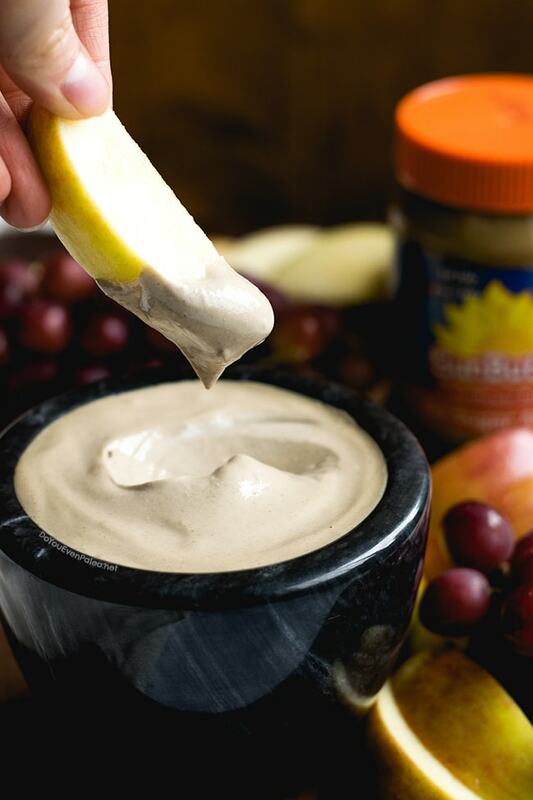 I quickly fell head over heels for this lightened up dip. 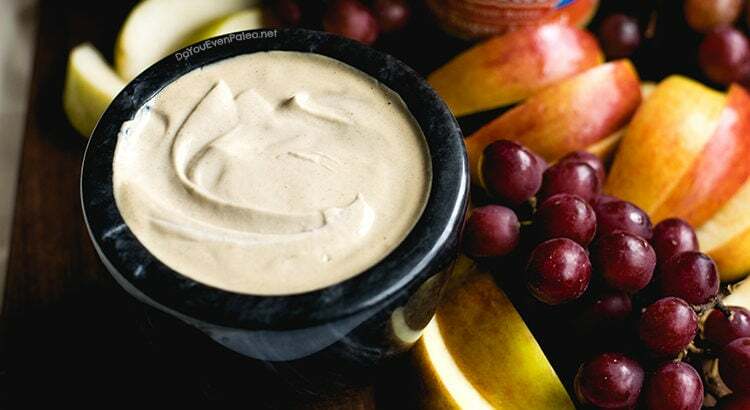 Sure, I love pairing apples with some almond butter or sunflower seed butter, but it’s easy to go way overboard with nut or seed butters that way… especially if you’re like me and you slather each apple slice with lots (and lots) of nut butter. This dip is more almond milk than sunflower seed butter, so it has significantly fewer calories and fat than nut butter on its own. I typically don’t care about stuff like that. But I’ve been known to down half a cup of almond butter with one apple… this is one way to avoid going overboard but still get my extreme nut butter fix with fruit. One last thing before we get to the recipe. 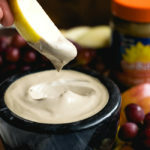 I always use unsweetened, sunflower seed butter for my recipes. I either make my own roasted sunflower seed butter or buy no sugar added Sunbutter. If you go with original Sunbutter, which has sugar in it, skip the maple syrup in this recipe. It will be sweet enough! Add all ingredients to a high-powered blender or food processor. Blend for about 2 minutes, until smooth and fluffy. Serve with fresh fruit (apples, pears, grapes, strawberries, bananas, etc.) or celery! Don't subscribe All Replies to my comments Notify me of followup comments via e-mail. You can also <a href='https://www.doyouevenpaleo.net/comment-subscriptions/?srp=2743&srk=87505361eee98908ddf6ccb8681f50d6&sra=s&srsrc=f'>subscribe</a> without commenting.